Having a trial into a product can be a great way to help get potential customers to commit to your product or service. With ThriveCart we have you covered and you have the ability to offer free trials for one-time payments and free or paid trials for subscription payment plans. We’ll cover setting a paid trial for a one-time payment product at the end of this article. This gives you the ultimate in flexibility. A free trial helps get your customers on board with no financial commitment, whilst a paid trial can help start that financial commitment to a product. 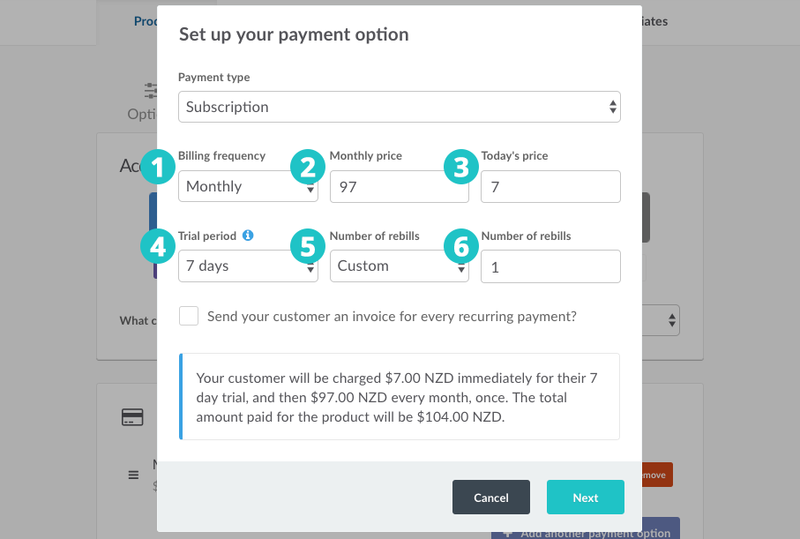 To setup trial for your product you under your product settings, you need to head to the Product tab followed by the Pricing tab. Next, we’re going to look at trials for the specific payment options. When setting up a trial for a one-time payment product we simply need to select the trial period drop down and how long their trial will be. Once this period is over the customer will be charged the fee in the price field. So, if 3 days was selected as above; the customer would not be charged anything at the time of checkout, then in 3 days, they would be charged $97. Remember you have the payment summary to confirm exactly what and when the customer will be billed. When setting up trials for subscription products we have an additional step to complete. With a subscription product, we have a Today’s price field. This will be charged at checkout either with or without a trial (you can, for example, use this for a ‘set up fee’ for a recurring service or product). The Today’s price field can contain a zero if you want to offer a free trial or contain a value if you want the customer to pay for the trial. The next step is to choose their Trial period and how long before their Billing frequency starts. In the above example, the customer would be charged $7 at checkout, then in 3 days time, they would be charged $37 and then $37 every month until they cancel. 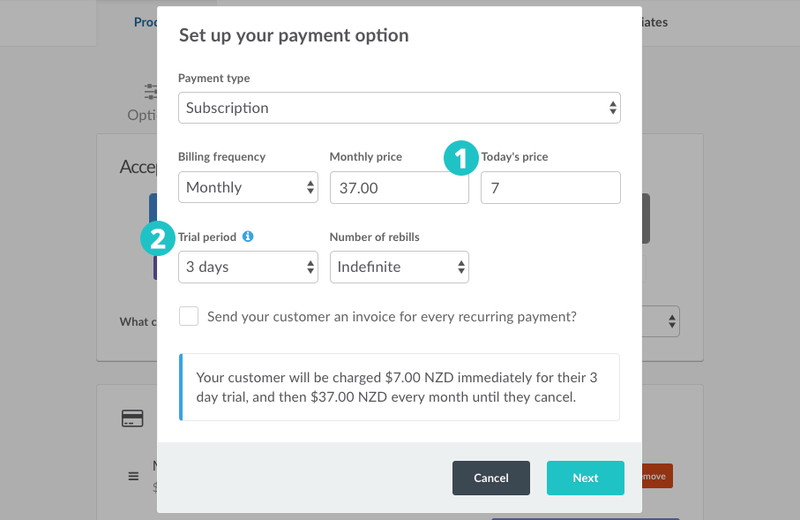 To create a paid trial with a one-time payment we’re actually going to make some alterations to the subscription payment type. 1. Billing Frequency – This isn’t so much important as the payment will be processed at the end of the trial period. 2. Subscription price – This is going to be what we charge the customer after the trial period is over. 3. Today’s price – here we’re going to set what we want to charge the customer for the trial. 4. Trial period – here we’re going to select how long we want our trial to be. 5. Number of rebills – we need to set this to custom. 6. Number of rebills – as we only want to charge the customer once after the trial we’re going to set this to 1. By completing the above you can create a paid trial with a single payment after the trial. Beneath the details, you will have an overview of their payment and the total amount the customer will pay.